Sometimes I use a product for so long without realising it doesn’t get to the LBQ wall of fame when it really should. This really takes the biscuit because I’ve literally been using it for about five months without realising and I’m only about half way through. 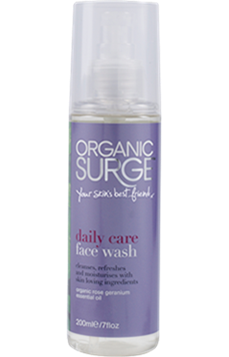 Organic Surge are a fab little brand that bring good quality, organic products to the masses as they’re affordable while being fantastic. Their daily care face wash has been in my shower for months and I literally use it every single morning because it does the job while smelling fabulous. It contains rose geranium oil to refreshen and moisturise the complexion and you get a hit of the scent as soon as you pump it into your hand. It’s nice to have something so fresh and pure to awaken your face in the morning! The product comes packaged in a pretty large bottle with a really handy pump. This is why it’s lasted so long because you need two pumps for your full face, rather than plopping out a blob that’s five times the size of what you actually need. It lathers delicately so you’ve got enough to really get into your skin and remove dirt, without ingesting a mouthful of bubbles. It feels fresh and light and leaves skin feeling clean without that tight feeling you can sometimes get. The formula is great for every day use, although I do use something else if my skin needs a good treatment or I have a breakout. Another one of the Organic Surge products I’ve been using is their new ‘Kiss and Make Up’ facial wipes. These are infused with chamomile and natural moisturisers to help hydrate your skin while removing impurities, plus the cloth itself is 100% woven viscose meaning it’s completely bio-degradable and compostable. The wipes themselves contain a lot of formula meaning they’re good at getting rid of dirt and don’t dry out easily. The pack itself is re-sealable, but with an actual decent seal, so this helps keep the wipes lasting for a long time too. I’ve had mine open for two weeks and they’re still fine. 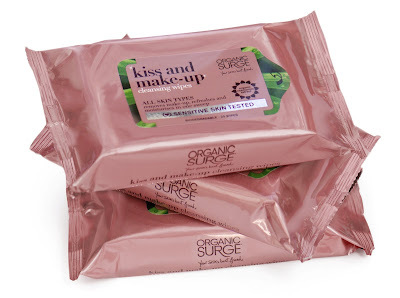 At £3.49 for a pack of 25 they’re not expensive either, so you can put good stuff on your face while helping the environment and saving some pennies. Previous Post Three Days Straight? so glad to read that the wash is good, i brought it recently but i haven’t got round to trying it yet! The hair care line is good too – there are a couple of reviews on here. I love the wash… luckily I am nowhere near finishing it!